Well, by now the entire galaxy knows of the release of the fake history of the Targaryens in Westeros in the book known as Fire & Blood, vol.1. Visit your local bookseller to pick this book up in person. I have to admit that I was rather lukewarm about this book, and not just because we are dying for The Winds of Winter. I felt like it was going to be a huge repeat of the World of Ice and Fire book that we received a few years ago. George did say this was going to be a big book, and it is. And George did say that it was going to be written from the single perspective of a maester, and it is, which means it is similar to a college level textbook. It is. But the color that is held within, the parallels to the main story, the speculative foreshadowing that can be gleaned from the text is rather deep, and good. I have been pleasantly proven wrong. When I heard that there was going to be a one and only public showing for this book and author, I could not pass it up. Here are a few notes from my time in New Jersey, a trip that turned out to be quite entertaining. My review of the Alysanne in the north preview excerpt from a few weeks back. The bridge into Bayonne, New Jersey. Under construction, but the views of New York city are right there. 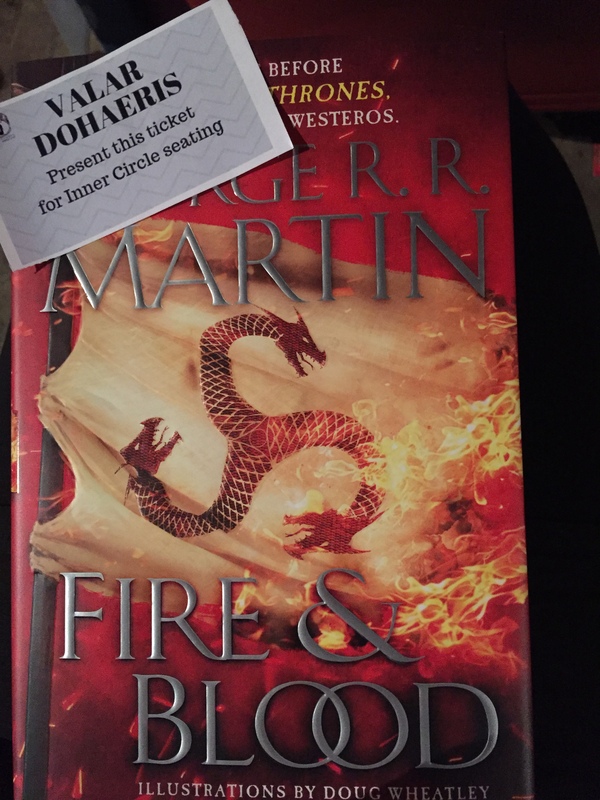 This event and interview with George RR Martin took place Monday, November 19, 2018 at the Landmark Loew’s historic theatre in Jersey City and was hosted by the WORD bookstore. Great business model in the WORD bookstore, check them out and support them if you can. The interviewer was John Hodgman… yes, the “I’m a PC,” guy from the MAC commercials. I started planning a few days before by coursing out my drive time, my arrival time, the wait line outside the theatre, how many other book fan nerds would I have to bond with, where do I go when I have to pee, name tag names? Ya know, all the essentials of travel when you leave at 8am and drink gallons of coffee on your drive along the way. However, before I even rolled car tire into Jersey City, I decided to make a quick detour to someplace that had been on my “to visit” list for a few years now. Bayonne, New Jersey. Yes, as a fan of the author and his entire writing career, and as an author myself (albeit middle grade fantasy), I wanted to visit the place that left such the impressions on Martin that he carries them with him to this day. I made a short re-route to Bayonne, down to the docks and first street and housing just where our favorite author grew up. Bayonne is wonderful, and it is a new hot spot for development. My first response was reacting to the glaringly new buildings and shopping centers popping up around these quaint older homes, clean streets, and small tree-filled parks. There were young children (7-9ish?) walking by themselves through the neighborhood! This gave me such a smile to see children holding that responsibility as we did way back the dinosaur days. I liked it here. George has mentioned in his Dreamsongs anthologies, as well as his re-postings to his writings to Marvel comics as a child, all the details and addresses where he grew up. This is how I knew where to go, down to the road names and blocks. My first stop was to the park across from the housing buildings. Note the big ol’ gnarly trees in the park where GRRM says he spent time. A gnarly tree in Bayonne. And from there you can see the multiple ships carrying cargo and waving flags that George said inspired him to want to travel and create worlds. Cargo ship on the Kill Van Kull about to pass under the bridge in to Bayonne. His story The Stone City is heavily derived from these scenes, as well as watching the lights and wonder of New York city right across the water. Something that Martin talks about in many interviews and in his Dreamsongs anthologies is how his mother’s side of the family, the Irish Brady’s, once owned the docks in Bayonne that made his family a powerplayer in the community… until the depression hit and the Brady’s lost everything. Martin does re-address this in the video interview below. However, this story of his lost family fame and wealth is what (partially) inspired some backstory for Daenerys and for the Manderly’s. … and am glad I did as in the interview (video below) Martin mentions the history of the dock, its naming and re-naming back to Brady’s Dock, and how he likes that is has this new sign. THE LIGHT OF DISTANT STARS: Here’s the thing of it. I was born and raised in Bayonne, New Jersey, and never went anywhere … not till college, at any rate. Bayonne is a peninsula, part of New York City’s metropolitan area, but when I was growing up it was a world unto itself. An industrial city dominated by its oil refineries and its navy base, it was small, three miles long and only one mile wide. Bayonne adjoins Jersey City on the north; elsewise it is entirely surrounded by water, with Newark Bay to the west, New York Bay to the east, and the narrow deepwater channel that connects them, the Kill van Kull, to the south. Big oceangoing freighters travel along the Kill by night and day, on their way to and from Elizabeth and Port Newark. When I was four years old, my family moved into the new projects on First Street, facing the dark, polluted waters of the Kill. Across the channel the lights of Staten Island glimmered by night, far off and magical. Aside from a trip to the Staten Island Zoo every three or four years, we never crossed the Kill. You could get to Staten Island easily enough by driving across the Bayonne Bridge, but my family did not own a car, and neither of my parents drove. You could cross by ferry too. The terminal was only a few blocks from the projects, next to Uncle Milty’s amusement park. There was a secret “cove” a kid could get to by walking along the oil-slick rocks during low tide and slipping around the fence, a grassy little ledge hidden from both the ferry and the street. I liked to go there sometimes, to sit on the grass above the water with a candy bar and some funny books, reading and watching the ferries go back and forth between Bayonne and Staten Island. The boats made frequent crossings. Often one would be coming as the other one was going, and they would pass each other in the middle of the channel. The ferry line operated three boats, named the Deneb, the Altair, and the Vega. For me, no tramp steamer or clipper ship could have been any more romantic than those little ferries. The fact that they were all named after stars was part of their magic, I think. Although the three boats were identical, so far as I could tell, the Altair was always my favorite. Maybe that had something to do with Forbidden Planet. Sometimes, after supper, our apartment could seem crowded and noisy, even if it was just me and my parents and my two sisters. If my parents had friends over, the kitchen would grow hazy with cigarette smoke and loud with voices. Sometimes I would retreat to my own room and close the door. Sometimes I’d stay in the living room, watching TV with my sisters. And sometimes I’d go outside. Just across the street was Brady’s Dock and a long, narrow park that ran beside the Kill van Kull. I would sit on a bench there and watch the big ships go by, or I’d stretch out in the grass and look up at the stars, whose lights were even farther off than those of Staten Island. Even on the hottest, muggiest summer nights, the stars always gave me a thrill. Orion was the first constellation that I learned to recognize. I would gaze up at its two bright stars, blue Rigel and red Betelgeuse, and wonder if there was anyone up there looking back down at me. Fans write of a “sense of wonder,” and argue over how to define it. To me, a sense of wonder is the feeling I got while lying in the grass beside the Kill van Kull, pondering the light of distant stars. They always made me feel very large and very small. It was a sad feeling, but strange and sweet as well. Science fiction can give me that same feeling. It was a cool day, temperature-wise, but quickly turned cold. I stood in line for two and a half hours with a cup of Dunkin’ Donuts coffee and made two friends outside the theatre. We shared ideas on the books and author, of course, but really we ended up laughing about so many other aspects of life. The the doors opened and the blessed heat (and restrooms) welcomed all the new guests. The Landmark was alive once more. After receiving my book, and giving it the crack and sniff (No, not like that! ), I scrambled from the lobby to the theatre seating. I was nervous with excitement to find my seat… the perils of not being tall have taught me to either get a good seat, or bring a phone book. Phone books do not exist anymore. I was happy that my Inner Circle spot bought me a happiness. One thing that I did do in advance, which I am happy that I did, is I signed up on the WORD bookstore for the Inner Circle membership which gave me nice discounts on merchandise, but more importantly, great seats for the GRRM interview. I was aisle seat, four people back from the stage- not bad at all. I was also behind George’s wife, Parris, which means I could hear the funny quips she said and did that do not show up in the video. For instance, she made the joke again that she is a ‘witch’. Based on her love of animals, nature, tarot, travels, and spirituality (as she says elsewhere), I’d feel safe saying Parris is a woods witch 🙂 George claiming that he loves turnips, and Parris promised him turnips if he married her, but she has yet to give him turnips. Say what! How cute is this? Now, there were a few drawbacks, as happens with large events. First being that the doors that were supposed to open at 6:30, did not open until atleast 6:45. Tough when it is so cold outside and you have a book waiting behind a thin piece of glass that you are dying to paw through. The second was that George was also about 15ish minutes late getting to the stage, even though I could see him walking around the side of the stage (behind the curtain) for several minutes. Together that alone cut about 30 minutes out of the Q&A time at the end of the interview. I had sent in 13 questions ahead of time, as asked in the email from WORD bookstore organizers, so I was a bit bummed when only about three or four basic questions made it to the stage. Overall, the theatre, its history, and the fantastical 16 year-old organist were amazing to take in during the wait. I have a recording of the whole interview, but I am going to give you the better version from Penguin-Random House here. For me it was a great, albeit mellow, time to sit and enjoy with ease the tales of George in person. John, a personal friend of George, worked exceptionally well as his interviewer. The experience was like hangin’ with friends in comfy pants. It was a live re-telling of everything Martin has talked about in Dreamsongs, enhanced with goofy jokes and funny giggles. I loved it! Everyone was so nice and pleasant along the way. Even the WORD bookstore woman who was acting as Inner Circle usher. She was funny and calm under her constant herding of we cats. So it wraps up, I feel delighted to have been there to watch George in person again (first time being at Balticon) and to have my shiny new book. But now I needed a pint of the black stuff. My prize in the end was the signed Fire and Blood book graced by yours truly. Me, I was talking about me. Man, oh man, did I started cracking that book open to read about Jaehaerys and Alysanne in no time flat. Thanks for reading along with the Fattest Leech of Ice and Fire.